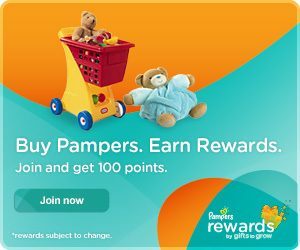 Pampers Gifts to Grow: 5 More Points! You are here: Home / FREEbies / Pampers Gifts to Grow: 5 More Points! Woo hoo! Pampers has 5 new Pampers Gifts To Grow points for us! Just head over here and enter code TWT836REG425PTY to get your points! This is a great loyalty program! Just enter codes that Pampers releases or that you find on packages of diapers or wipes to earn FREE products! I’ve used my Pampers points to get some great gifts for my daughter for FREE! Click here to see the previous codes I’ve posted! You can also find out how to find more Pampers Gifts To Grow codes!